SNMP, or Simple Network Management Protocol, is a protocol that is used by a multitude of different devices that connect to IP networks. You can think of it as a useful tool that allows us to gather information about your current network environment. Because it such a common software component and is compatible with nearly all network devices, many monitoring tools use it, which allows system and network admins a clear picture of what is happening in real-time. Some items that require monitoring are server usage stats, such as CPU utilization, RAM usage, Hard Disk Space, Network traffic on the LAN interfaces, and other critical information that relates to your server infrastructure. If your environment is highly populated with tens or even hundreds of servers, then SNMP allows your applications to read this data as it becomes available, so that you can start troubleshooting and repairing these issues as they occur. SNMP also gives similar stats about network hardware, such as firewalls, routers and managed switches, and can even relay supply level information from office equipment such as network copiers and printers. Today we will be looking at 10 such monitoring tools, and we will see what the main differences are between them. This will help you in your decision making when looking to get a new software package for your environment, and hopefully will allow you to avoid choosing a software package that doesn’t do what you need it to. 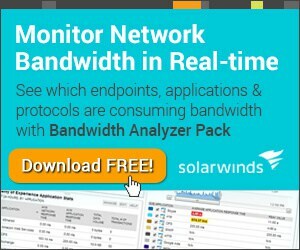 Solarwinds Network Performance Monitor is an application that uses SNMP to help system administrators reduce the likelihood of network outages. 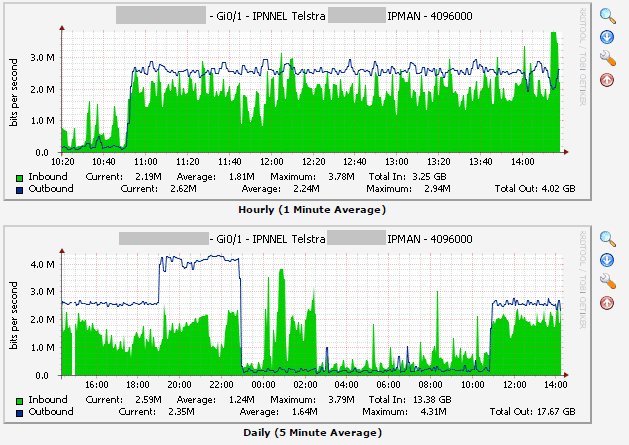 This is made possible through proactive monitoring, and has the potential to improve network performance as well. Despite the deep level of detail that the application offers its users, there is a simple quality to the user interface that makes it easy to use, and is a helpful tool when troubleshooting network issues. 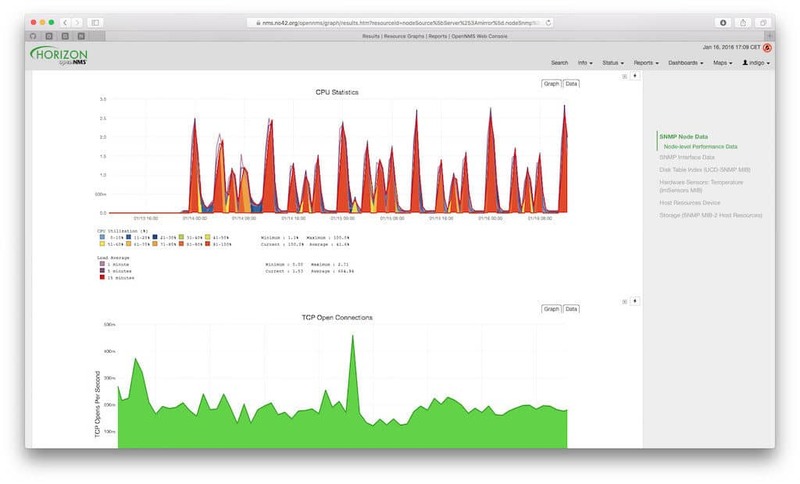 Users can create customized dashboards for each of their vendor specific network devices, and there are analytical tools such as graphs and charts that will help with visualizing your network traffic. 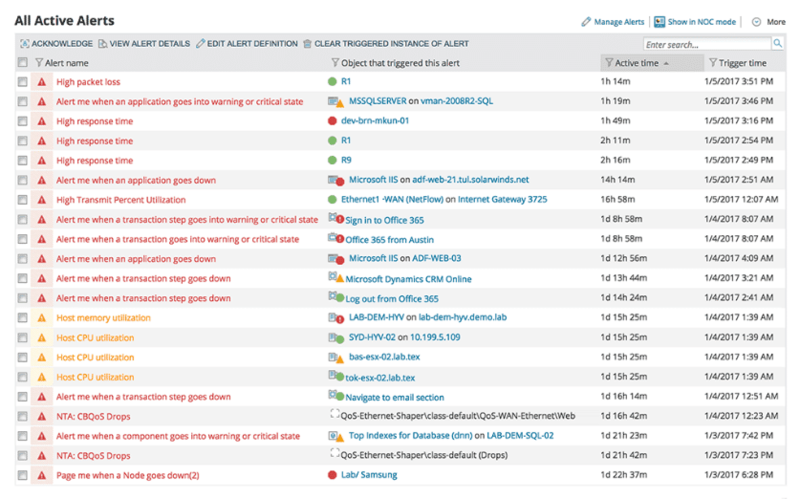 Errors and network issues are all accessible in one easy to read location, and information such as the alert type, object triggers and active alert times are all visible, which makes problem tracking much easier. 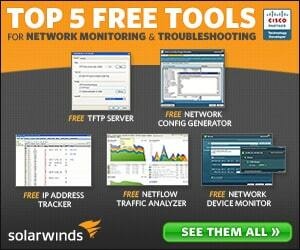 Solarwinds is an enterprise-grade product that offers world class monitoring tools, and is available as a 30 day, fully functional trial. After this has expired, users have the option to purchase the product. 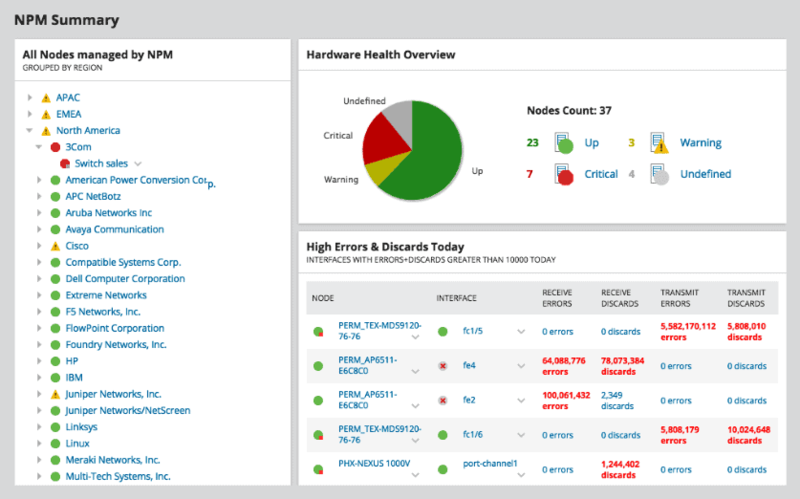 Solarwinds NPM is One of the Best in Class software solutions for using as an SNMP Monitor and has the functionality and capbilties of being an All-around contender for the Best Networking Monitoring tools in the world! 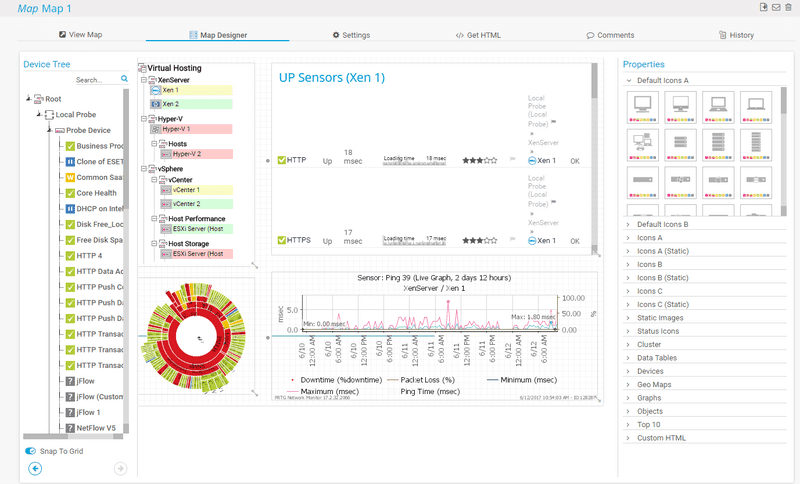 OpManager is a Unified Network Management solution that manages to monitor your network performance and online status without needing any additional software. The software package has plugin support, which means that you can enhance your monitoring capabilities based on what your requirements are. 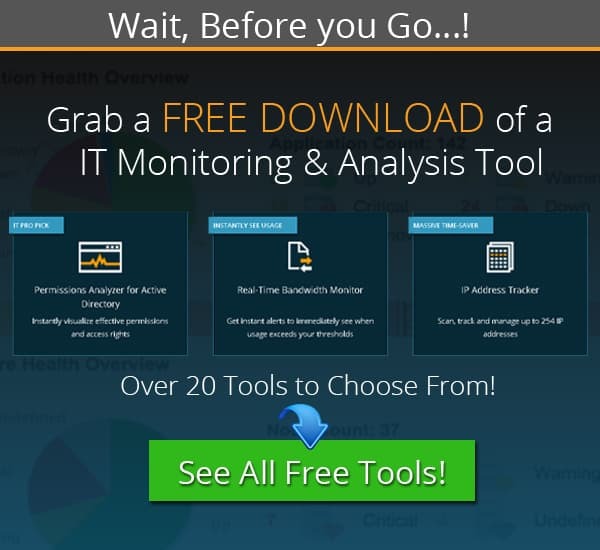 These add-ons include bandwidth usage monitoring, firewall log analysis, and more. The way that the product has been designed means that your IT staff are able to quickly find network errors as they occur, and then react appropriately. Bandwidth monitoring ensures that business critical applications are getting the required bandwidth for them to continue operating properly, and network attacks can be stopped before they cause too much damage or downtime. 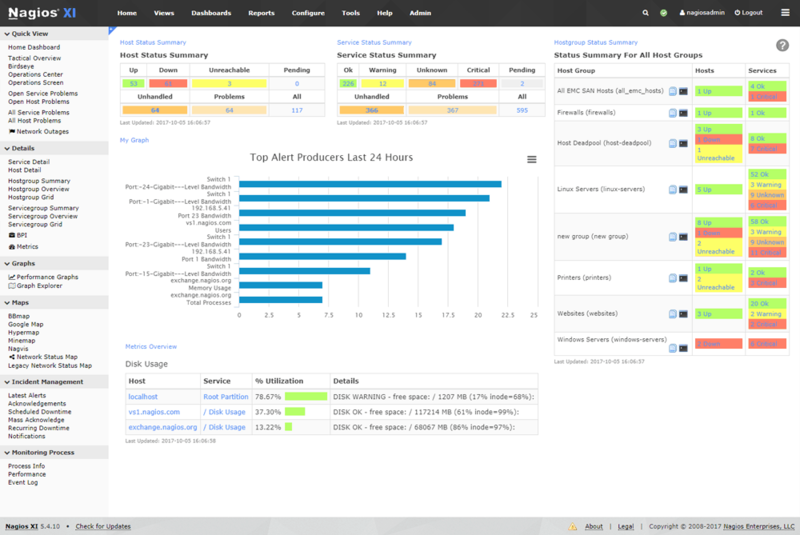 OPManager has all the features and reporting tools that you would expect from a network monitoring suite, and the way that it scan the network is impressive. Pricing starts at $715 USD for 25 devices for the Essential package, and goes up in device count in subsequent packages. 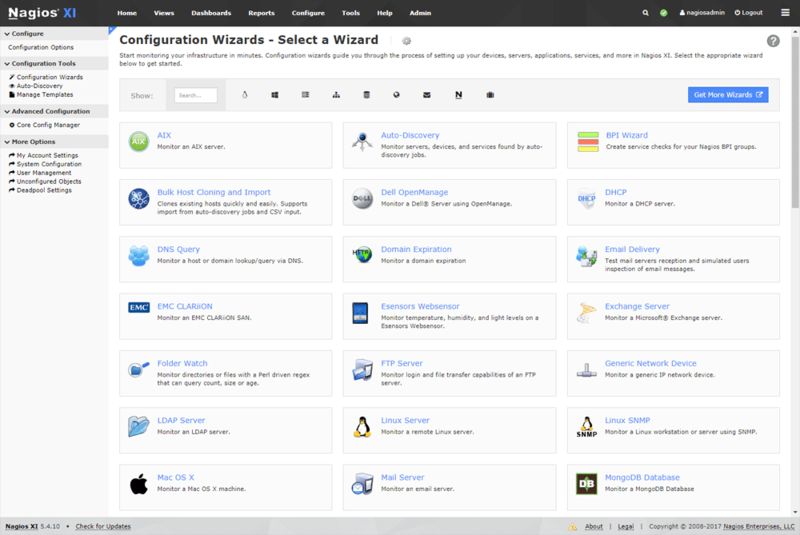 Download OpManager FREE & Try it Today! PRTG is another SNMP based tool that puts administrators back in control of their networking environments. PRTG can perform automatic network scans that require very little information to setup. Simply input your IP ranges and let the software do the rest. It automatically recognizes a wide variety of devices, and applies predefined templates to each recognized class, saving you a lot of labelling and configuration time during the initial setup phase. PRTG offers an interesting feature whereby administrators can create maps that hold specific device information within them. This allows for the network information to be displayed coherently in different configurations, and each map is hosted on its own webpage. This allows IT staff to keep a few extra tabs open on their favorite internet browser to ensure that they are able to monitor the network easily. PRTG offers its users a fantastic array of monitoring tools, and thanks to its SNMP and WMI integration, it is able to auto-discover devices on your network with ease. Alerts are handled by the application, and free Android and iOS apps are available for smartphones. This gives your team excellent access to the state of the network, even when they are away from the office. There is a free version that has a 100 device sensor limit, as well as paid-for versions, which start at $1600 USD for 500 sensors, and go up from there. Next on our list is Nagios XI, an enterprise server and network monitoring software suite. It is able to monitor all of your network infrastructure, including applications, specific services, operating systems, network protocols, system metrics and more. Third party add-ons enhance the functionality of this product suite, meaning that your specific monitoring requirements can potentially be catered for if they fall outside of the application’s main scope. Nagios uses a powerful monitoring engine called Nagios Core 4, which is said to provide users with good performance and low resource consumption. The end result is a monitoring solution that scales incredibly well as your network devices start to increase into the hundreds. 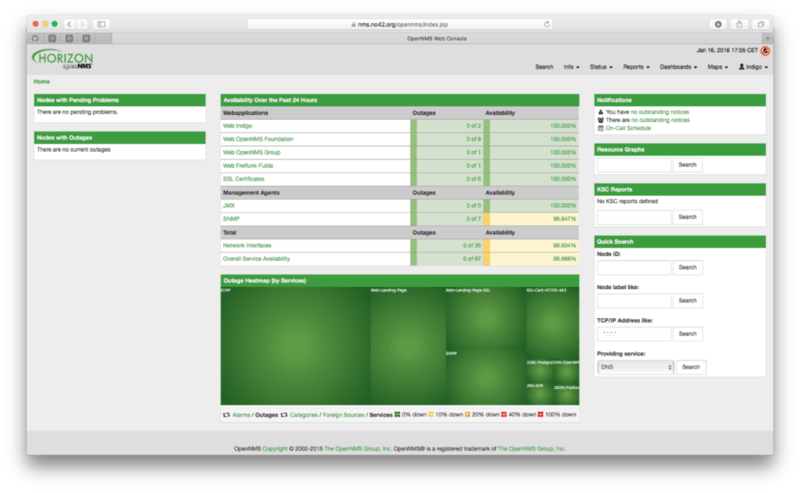 An informative user interface ensures that your team can get a centralised view of the application, with powerful dashboards providing ‘at a glance’ information. Setup is very easy, and Nagios XI provides a simple setup that will have your monitoring environment up and running in a few minutes. Simply enter in all of the necessary information about your network and wait for the system to complete its network scan. Pricing starts at $1995 for the Standard Edition. OP5 offers users a fully customizable experience that provides interactive customized dashboards and graphs. This customizability allows users to create their own custom dashboards which display only the most critical information that is necessary to keep the network running smoothly. 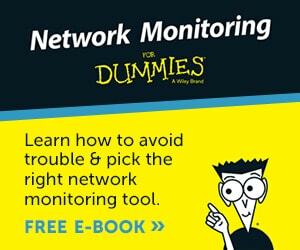 This allows you to gain a deeper understanding of what is happening on your network, in real-time. Advanced filters add an additional layer of customization that will give you full control over your reports. Anyone that has worked within an enterprise level IT department will tell you that scalability is essential when factoring in any potential system, and network monitoring is no different. OP5 has one configuration interface for multiple locations, which gives its users complete control over all locations in one view. Load balancing and fault tolerance is built into the application, which means that it can continue to function, even in the event of network or system failures. 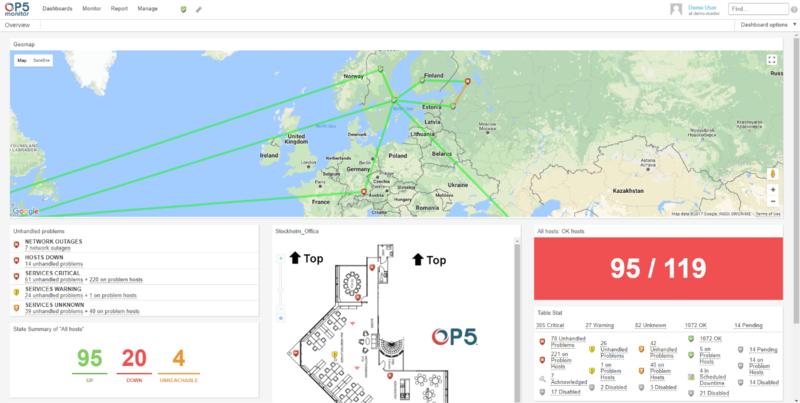 OP5 also has an automation feature that allows your IT staff to receive important information as it is needed, and the smart monitoring system has a self-healing capability that repairs basic issues automatically on your network. OP5 has its own API, making it possible for you to integrate its features into your existing help-desk and intranet, creating a customized solution for your organization. Zabbix is one of the many Open Source SNMP based network monitors that are currently available on the market, and comes with some good features. It is able to detect problems on your network automatically and is highly flexible when defining what needs to be monitored, and what can be ignored. The system has a severity scale, alerting your IT team to how serious an issue is, and there is a root cause analysis for after the fact investigations. There is also a trend prediction feature that gives your staff an estimate based on previous events as to how stable your network is likely to be in the coming weeks and months. 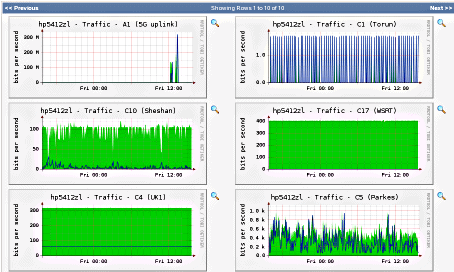 Zabbix can monitor network bandwidth usage, packet loss, interface errors, server CPU and memory utilization and router information such as aggregate Network throughput. 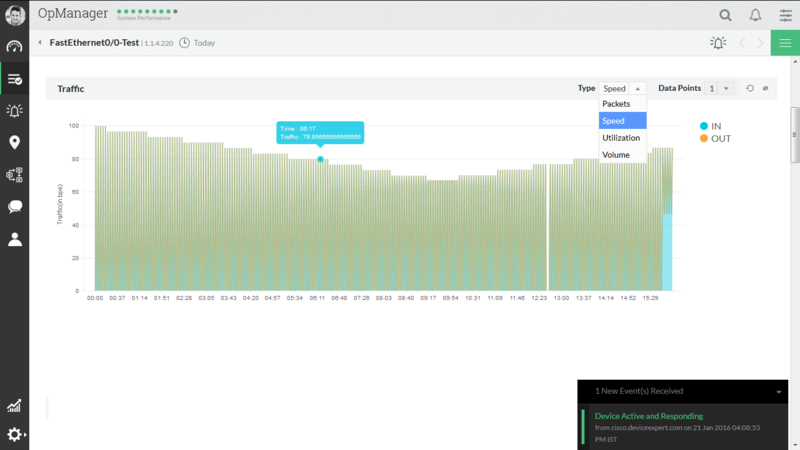 Other network health issues that Zabbix can detect include link errors, current system status, device temperatures, power supply measurements, free disk space, fan operation, and more. 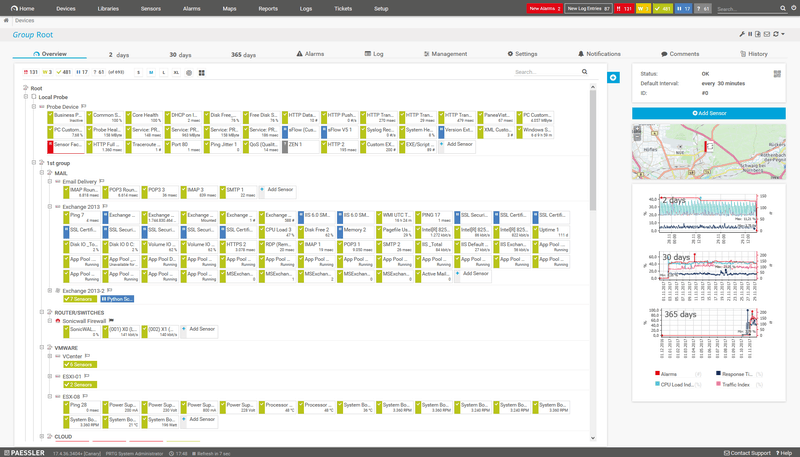 Zabbix offers out of the box support for all popular vendors, and these parameters can be tweaked and adjusted further to suit your needs. Zabbix is able to collect vital network information from your environment by using multiple technologies, such as SNMP and IPMI. There is also IPV6 support for environments that have already adopted the standard. As this product is open source, it is free to download and use, although you will need to pay somebody to assist with support if you encounter any issues. 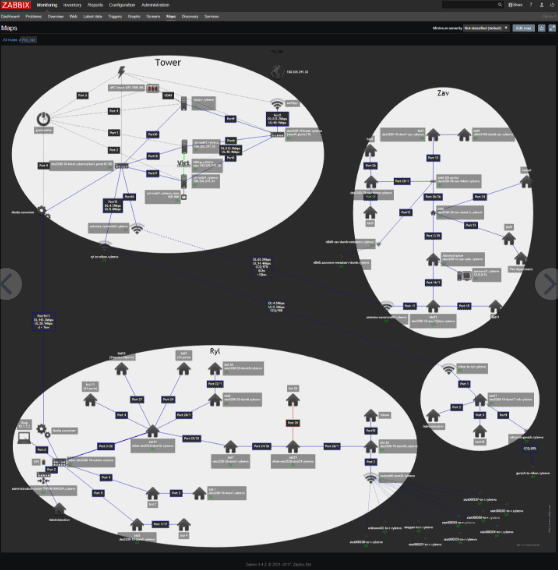 Spiceworks have created their own network monitoring tool, which is able to keep an eye on up to 25 devices within your environment. This means that critical servers, routers and switches can be monitored in real time, and in the event of a failure or error, you will be notified via email or via the webpage console. Installing the software is simple, and after the automated system scan has completed, you will be greeted with a unified page that displays all of your devices in one convenient spot. This product is ideal for smaller businesses that do not need to monitor hundreds of systems and appliances, but rather a select few critical services and servers. The software is free to download and to use, and the folks over at Spiceworks are happy to help you with any questions you may have about setting this up in your own environment. 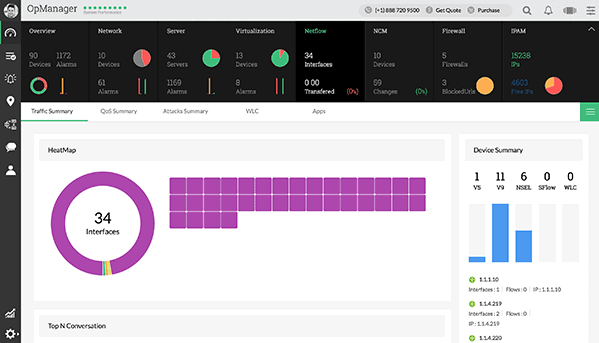 There are customization options available to you when setting up the application for the first time, so you can choose exactly the right monitoring services that you need for your network. 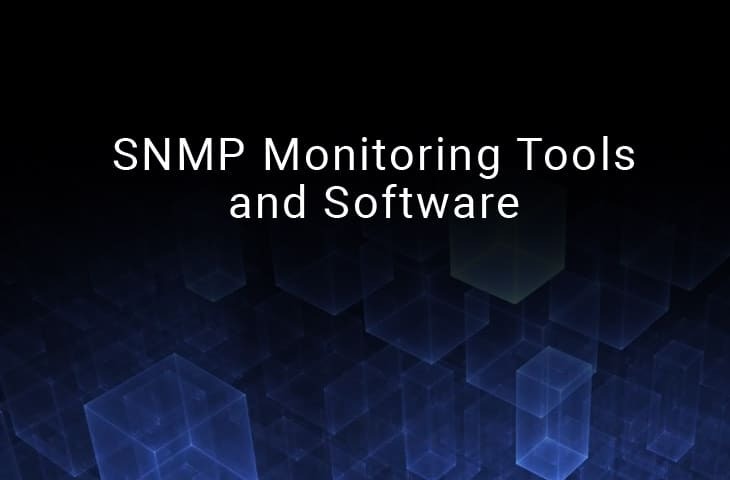 SNMP ensures that all of your network devices are detected and reported on when you initially perform the setup, which takes just a few minutes to complete. OpenNMS is best described as a carrier grade network monitoring suite that is available in 2 different forms: Horizon, and Meridian. Both of these derivatives are open source and free to use, but here are some differences between the two releases. Meridian is the stable enterprise version that uses only tried and tested technologies, making it a stable candidate for your business’s monitoring requirements. It is rock solid and is supported by a growing community of users that are ready to help with any questions that you might have during the setup phase of your installation. The experimental Horizon version is seen as a testing ground for innovation and new technologies. As is the case with new technologies, there are stability issues that sometimes need to be overcome when testing and refining a new implementation. Both versions of OpenNMS offer users a comprehensive application that has service assurance and performance management features at its core. Layer 2 discovery is accomplished thanks to the SNMP implementation, making auto discovery possible on your network. OpenNMI has received numerous awards over the years, thanks to its innovative approach on the one hand, and its rock solid stability on the other. As with most Open Source projects, there are value add purchases that users can make to give them a more commercial experience. Out of the box, OpenNMI manages to impress with its long list of features and functionality. If you have the expertise and are on a budget, then this could definitely be worth checking out. Cacti has been around for a very long time, and is a graphing tool that uses SNMP at its core. It uses this data gathering protocol to allow it to build comprehensive data sources that are rich with real-time data for network and IT staff to monitor. It features a hierarchical user management structure, which allows you to assign appropriate permissions to the necessary staff without revealing sensitive data to non-authorized personnel. This is a plain and simple monitoring tool, and although it may look a little dated when compared to the other systems in our round up, it is important to remember that Cacti has been around since 2004. 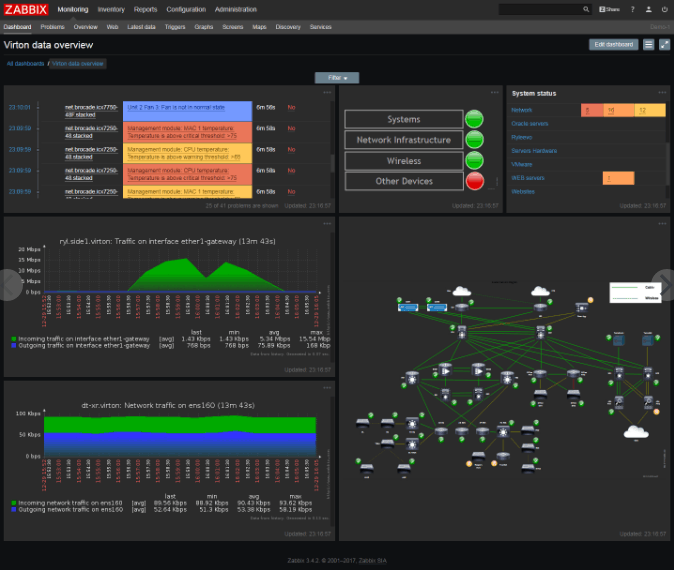 Cacti’s graph display allows users to look at their network from a tree view, where specific graphs can be placed for easy access and monitoring. Cacti is essentially a graphical frontend to the RRDTool, and to this end it does an excellent job. It is PHP driven, and is extremely stable. The application might feel a little less featured than some of the newer examples, but with enough configuration and customization, Cacti can be implemented on just about any network, giving you a simple and stable network reporting tool that can be added to your network toolbox. No matter what your reasons are for wanting to keep an eye on your network in real-time, there is no shortage of perfectly capable products on the market, both paid for and free. 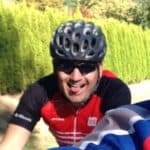 Which product you choose will ultimately depend on what your feature requirements are, and how much of a role your product support will need to play if you are going to be maintaining the system yourself. Smaller businesses can certainly benefit from a free or open source application, but established companies with sites located around the world will need a solution that is scalable and more substantive than a free application. Each of these products have their own key benefits that distinguish themselves from one another, so when deciding on which one is best for you, decide on what you need to be monitoring in the first place. Once you understand your operational requirements in terms of reporting and monitoring, you can take the next steps towards implementing a solution within your business. Most of these applications have trial versions that you can install for testing purposes, so that is a great place to start.